Are you looking to buy a diamond? One of the first decisions you will need to make will concern the diamond’s cut and shape. This article will try and teach you everything that you will need to know before taking this important step. We should probably explain that there is actually a difference between the “cut” of a diamond and the “shape”. To learn about the vintage diamond shapes and cuts, click here. In the market, the words cuts and shapes are used as a synonym. Technically though, they are different. We will use both phrases to mean the same thing, but it is still important to first learn their official meanings. The shape can be almost anything, really. Although there is a range of well-established shapes that are commonly used, anything goes. If something is outside what can be considered standard, it is simply termed as “fancy”. 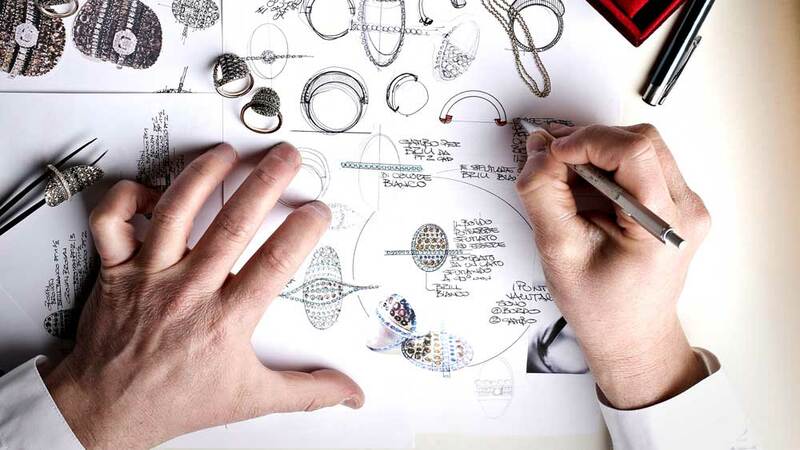 This allows ring makers to be as creative as they want to be. 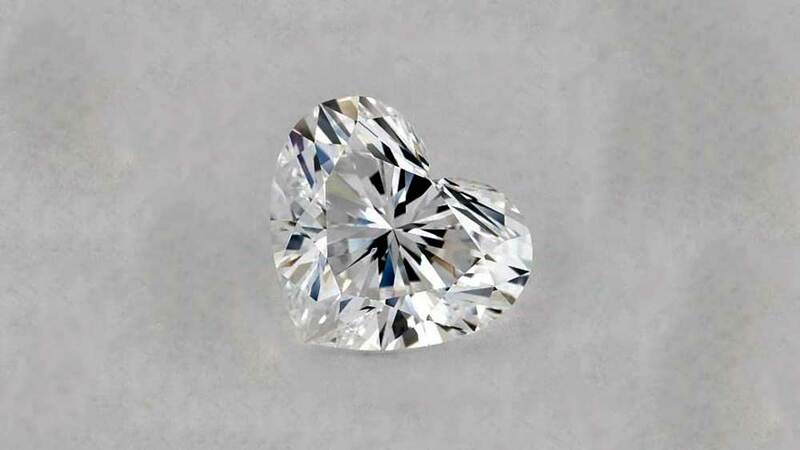 As an example, we now see far more heart-shaped diamonds than we’ve ever previously seen. There are really only three distinct types. One is the “step” cut, as typically seen on emerald and Asscher cuts. The other is “brilliant” which contains non-linear faceted cuts, like the round brilliant or cushion. The third category is a mix between the first two cut types. Just for clarity (of reading, not of diamond), we’ll use the term “cut” to describe everything we mention here. This is the common way of talking about diamonds, and we have no wish to confuse things. Decide for yourself if we really mean “shape” or “cut”. Different cuts do different things. They reflect and refract light differently, for example, and can even be employed to appear bigger than the carat weight would indicate. As we go through a period where the convention is often disregarded, fancy diamonds are increasingly popular. These can be fancy cuts, as in the hearts we mentioned, or fancy color diamonds being used for contrast or effect. There are, of course, some cuts that are more popular than others. The vast majority of diamonds used in engagement rings today are of the modern round brilliant cut. This has its roots in cuts that pre-dated modern cutting methods and is directly descended from the old mine and old European cuts. 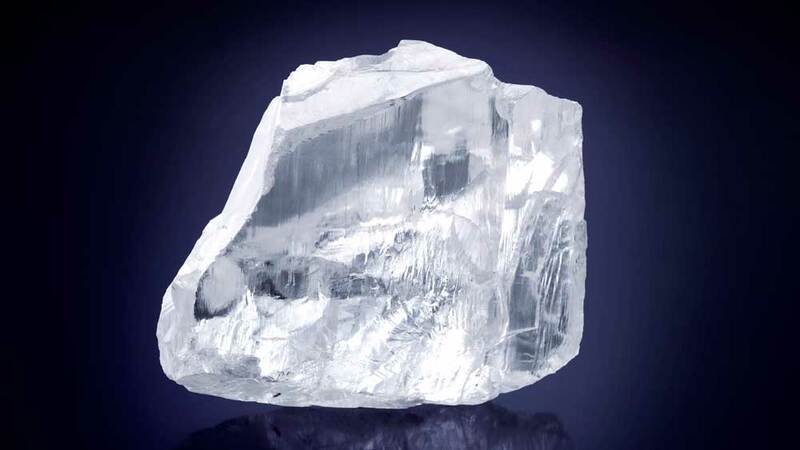 A natural diamond in its rough i.e. extracted state isn’t the random shape you might expect. Almost all rough diamonds are octahedron in shape. Imagine two pyramids placed square end to square end, much like a 3D diamond shape, and that is what a natural diamond shape is. This means low yield for round diamonds and high yield for diamonds more like the original rough shape. In the olden days, the expert diamond cutters would spend days or weeks planning out the best technique to cut the diamond. Nowadays there has been developed advanced software that calculates how to cut to maintain the highest yield. Brilliant Cut Diamonds include all the diamonds that were developed within the past 50 years. These diamonds are mathematically designed for the ultimate brilliance. 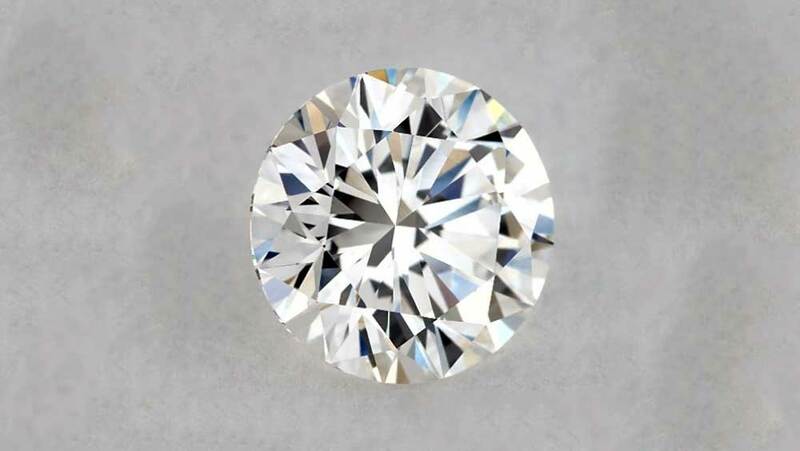 Cut for its light reflection and refraction properties, round brilliant diamonds make up 75% of all cut diamonds today. Because rough natural diamonds are not round in form or structure, round cuts of any kind mean a lower weight in the final polished stone, as more of the rough diamond is lost to achieve the shape. This means, carat for carat, round brilliant diamonds are usually more expensive than other cuts. Aside from the round brilliant cut, there are several others in common usage today. 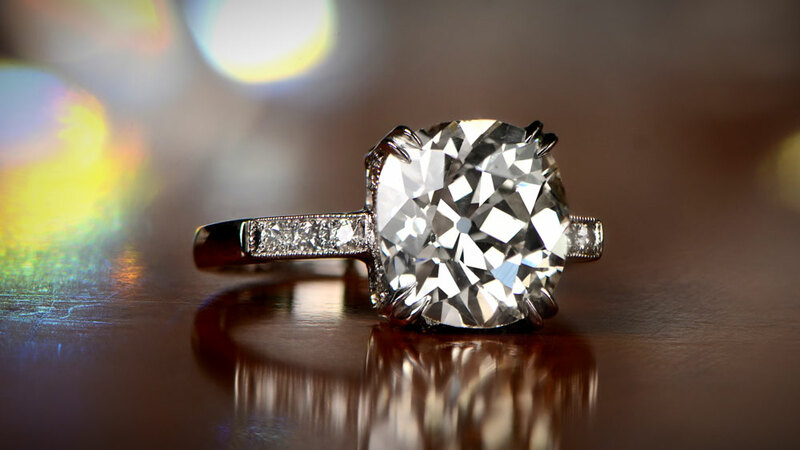 With the resurgence in demand for antique and vintage styles, the cushion cut has made a significant comeback recently. The cushion cut is nominally oblong, but with curved edges, making it look like a cushion or pillow. It has large facets and no sharp corners, and the standard for the cut is curiously relaxed in its demands. Because the length-to-width ratio of a cushion cut can vary, it often comes down to personal preference. Some people want it as square as possible, some want it a little more rectangular. The number of facets can vary on the pavilion, unlike on other cuts which demand consistency, and this makes for different brilliance or fire levels. The oval cut is one of those which allows a diamond to appear bigger than its stated weight. 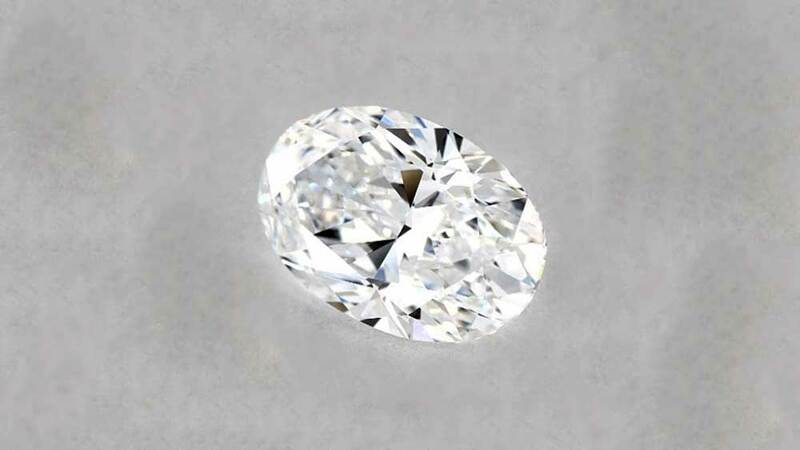 As what is effectively an elongated round brilliant cut, the oval has many of the same fire and brilliance characteristics. One of the potential issues with oval cuts is the bow-tie effect. On poorly cut stones, not all the light entering has the opportunity to escape again, This creates black triangles within the stone which create a bow-tie effect across the width of the diamond. 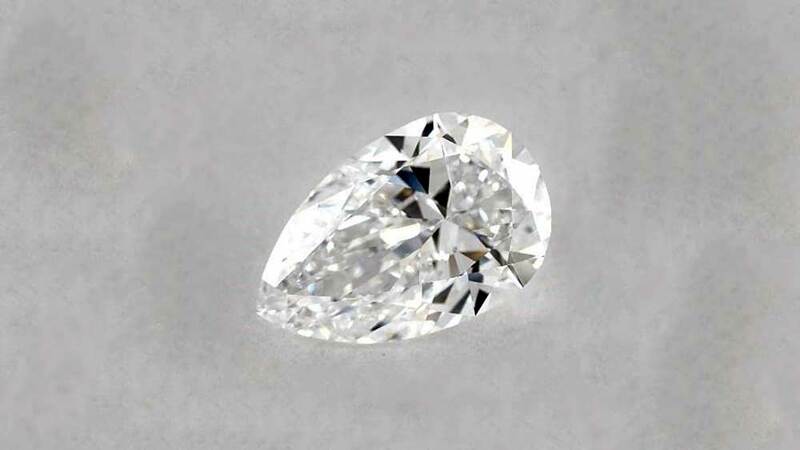 Marquise diamonds, which are similar to the oval but with pointed ends, can suffer from the same problem. The pear cut is a sort-of pear/marquise hybrid, round on one end and pointed on the other. What makes it a little different is the requirement for exact symmetry. The point at the bottom should align precisely with the apex of the curve at the top. Although another potential victim of the bow-tie effect in poor examples, it usually isn’t to the extent of oval or marquise cuts will see. An argument which often rages around pear cuts, is how they should be worn, Should the point be towards the body, or towards the tip of the finger? The answer is, wear it however you want. It is true that having the point towards the fingertips can make the fingers and hand look more slender. It’s also true that, when showing it to someone in front of you, the eye will also be drawn upwards if the point is towards the fingertip. But, regardless of these considerations, it comes down to personal preference. Your ring, your rules! The heart cut is one of those things you will love or hate. Is it the ultimate expression of love, or something cheesy which should be filed under “bling”? We can’t answer that, and it’s entirely up to you, but there are some things to consider before taking the plunge on one. Heart cuts are better suited to large stones. Smaller stones don’t really convey the shape so well and can end up looking like a pear shape due to the limit of the double arc at the top. If being set in an engagement ring, then a 3-prong setting is preferred, so that the heart effect isn’t lost. Princess cut diamonds have only been around since 1980. They are cut as close to square as possible, with the price dropping sharply, the more rectangular the diamond. Because they work well in almost any setting, they have become increasingly popular in engagement rings. 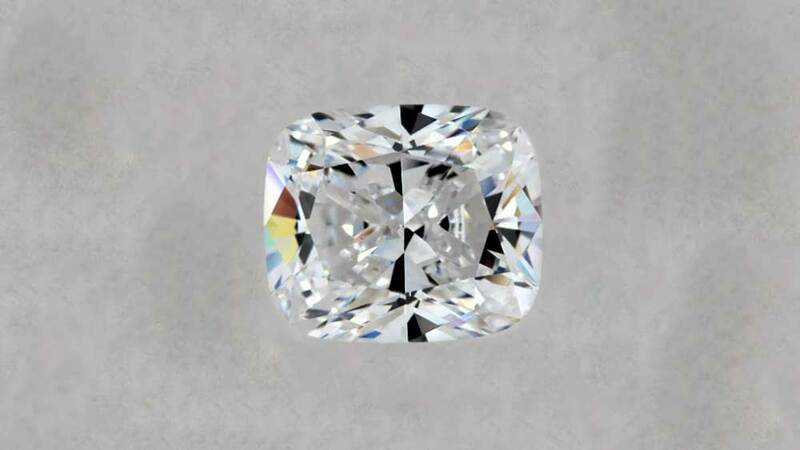 The added advantage for designers and makers is that the yield from a rough stone is higher than any other cut, due to a princess cut being close to the shape of one half of the rough stone. This means a yield of around 60%, against around 40% for a round stone. The emerald cut was originally designed for cutting, yes, emeralds. 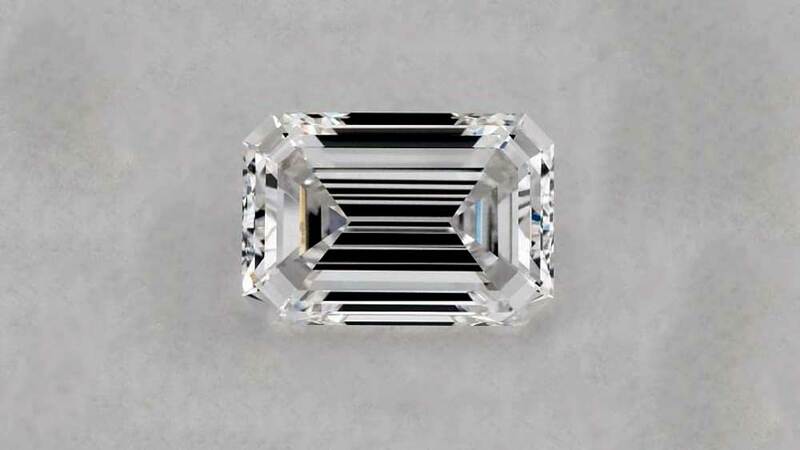 The current modern standard is a direct descendant of the Asscher cut (see below), although emerald cuts have actually been around for over 600 years. Because of the steps of the cut, light is reflected very differently from the 58 or 59 faceted brilliant cut, creating a hall-of-mirrors effect. Usually rectangular in shape, the emerald cut is an increasingly popular engagement ring cut. Bold, with its influences coming from the art deco period, it is designed to be used in a single stone setting. 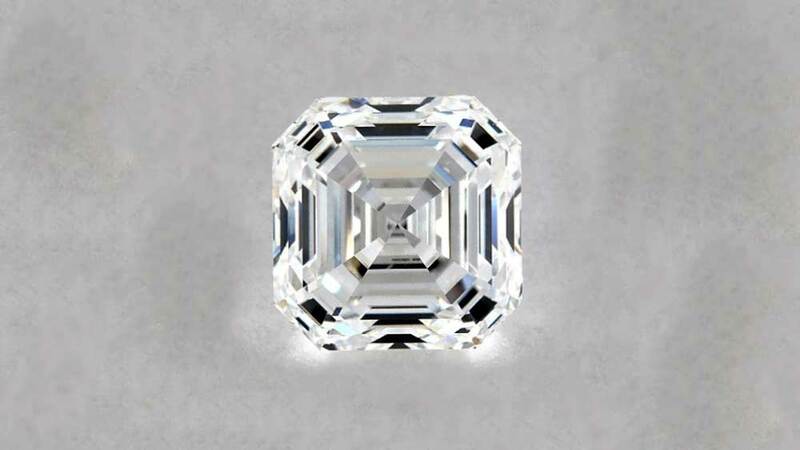 The Asscher cut is one of the very few cuts that have a patent and is named for its inventor. Influenced by the original emerald cut, the Asscher cut standardized and perfected the shape in the early 1900s. Square in shape, rather than the rectangle of the true emerald cut, it is indeed classed as a square emerald by GIA. The main difference is that is has a much higher crown, and a much smaller table, producing much more brilliance than an emerald cut can. Diamonds can be, and are, cut to all shapes and sizes. There are standards for the more popular shapes, including some fancy ones, but rules are only rules for as long as people apply them. 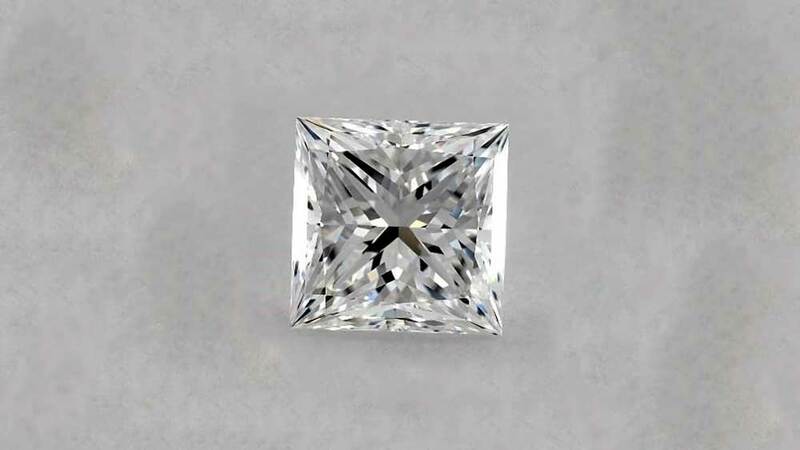 If you like how a diamond looks, and it is within your budget, then go for it. Nobody who looks at your ring will ever query the shape of the diamond!